Mother Nature tried to stop us from having a night of racing. But Mike & Krista Kerns pushed forward and raced all the events. Great job to both of you. 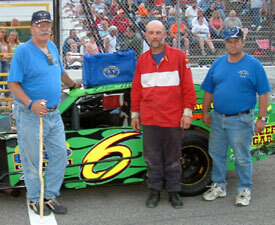 Modified driver # 6 Don Morse was presented the MARFC Uniform/Helmet bag for his many years of racing and only missed one show in those many years. Great way to show your support of your home track. Special thanks to Larry Loynes for all his words to help promote our club during the evening. Looking forward to returning again next season. Thanks again to the Kerns for having us. Thanks to Kenny & Larry Letts and our VP Larry Iacoboni for all the assistance during the evening.